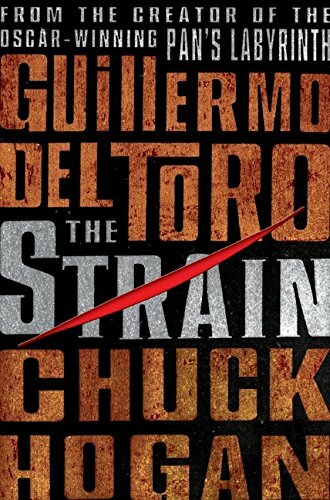 Review: The Strain by Guillermo del Toro and Chuck Hogan – King of the Nerds!!! I had planned on finishing Open Your Eyes first but I mentioned that I had The Strain to a friend and was immediately guilted into reading this first so that I can hand it over. The Strain is the first in a trilogy of novels co-authored by filmmaker Guillermo del Toro and Chuck Hogan. While I am both familiar and a fan of del Toro’s work, from the woefully underrated Blade II to the masterful and haunting Pan’s Labyrinth, I am not at all familiar with Mr. Hogan. The Strain begins with a simple story a grandmother tells her grandson about a vampire. The kind of folksy, cautionary tale whose moral involves eating your vegetables and obeying your elders. From there the story shifts to modern day where a Boeing 777 lands at JFK, then immediately falls silent. As the horror is slowly revealed events slowly spiral out of control as vampirism begins to spread quickly across the city of Manhattan. The Strain is a fairly quick read that at 416 pages manages to maintain a razor’s edge like balance between pacing and atmosphere. Unfortunately it walks that same line between originality and familiarity. Though, on the whole, the balance is definitely in favor of originality. With vampire stories, as with zombie fiction, there are two major paths writers can take. On the one hand you have what I think of as the “supernatural” approach. In this type of vampire tale the vampire remains shrouded in mystery and magic, it’s origins frequently mystic. These vampires, like those in Stephen King’s Salems’ Lot are those weak against faith and religion. The other approach is what I like to think of as the “scientific” approach. Vampirism seen as a disease rather than some sort of curse with the more mystic superstitions frequently explained away as elements brought into the equation by the storytellers who have popularized the vampire tale. This supernatural/scientific binary is more a sliding scale rather than a question of absolutes. One of The Strain’s main characters, Dr. Ephraim Goodweather, is a CDC epidemiologist working for a special project in New York when the story begins and the story takes a decidedly more scientific approach to vampires than a supernatural one. Since the early narrative threads follow Dr. Goodweather the whole vampire threat is approached as an infection giving the novel more of an X-Files vibe than a Dracula vibe. However, like that show, for all its explanations and detail the Strain manages to hint at other forces at work and manages to leave some aspects of vampirism shrouded in some mystery. At times however that mystery feels implicit, a by-product of time constrains and plot momentum rather than any conscious decision to maintain an air of mystery. If you’re tired of the overblown gothic interpretation of the vampire as a tragic or lonely figure than you will likely find a lot to like here. del Toro and Hogan cast a gigantic spotlight on the vampire as a monster more than anything else. In fact, save for some old standbys (silver and sunlight, mostly) The Strain throws most traditional elements out the window, especially in terms of vampire physiology. As I mentioned previously the vampire here is like the vampires of Blade II, not that they are at all physically similar, but rather that they reinterpret their physical appearance and inhuman functions in new, interesting (and perhaps most importantly) twisted ways. That same scientific approach certainly helps in the above allowing for the author’s to work in more detailed descriptions of vampire anatomy and, at the same time, allow for a greater contrast between humanity and monsters. My biggest problem Dr. Ephraim Goodweather; a CDC epidemiologist and for all intents and purposes the novels protagonist. It is then unfortunate that despite that fact I felt he was the least interesting of all the characters and, for all his emotional hang-ups and complications, I never once managed to create any kind of emotional connection with the character. In fact the most interesting characters, and in many cases most interesting plot devices, are explored only briefly. In particular Abraham Setrakian’s encounter with a vampire during his time at a Nazi extermination camp could have been a story in its own right but is instead explored only in several disappointingly short “interludes.” Setrakian is a character who could have used an entire novel to himself, or even an entire series, and he has hints of a rich and detailed past that absolutely deserve further exploration. Perhaps the most fascinating character is one introduced about mid-way through the book, that of Vasily the exterminator. The son of Russian immigrants he is a terse, quiet man that is good at his job: killing rats. We get a very tiny glimpse at his character but again he remains woefully underutilized. In fact, Vasily brings to the fore perhaps the most underutilized character in the entire novel: the city of New York itself. Despite being spread about the five boroughs (well, except for Staten Island) I never got a sense for the unique feel that is New York. You get glimpses here and there but it isn’t until Vasily’s introduction when the city really comes to life. For a book set entirely in New York City (save for several flashbacks) 200 pages is far too long a wait to actually feel like you’re in New York City. Complaints aside I did find the novel an enjoyable read but it just didn’t light a fire under me. The Strain lacks the subtlety of something like Pan’s Labyrinth and goes for the more straight out horror. At the same time the complete inhumanity and alien nature of the novel’s depiction of vampires lends it a rather unsettling sense of other. However, that divorce between vampire and human strips the monster of some of what makes it so unsettling; its familiarity. I might go as far to say that this isn’t really a vampire story. In fact in both tone and plot structure at has more in common with a zombie survival. The Strain, as a amalgamation of both vampire and zombie fiction, as a fun, fast-paced read that is not ever, not for even a second, boring. At the same time it is a novel whose moments of greatest are often occluded by lackluster characterization and lack of an oppressive or vivid atmosphere. I know this is a decided mixed review. I’ll only close by saying that if you’re looking for a fun, fast-paced, popcorn moviesque monster novel then, come June, give The Strain a try. Just finished reading The Strain. An interesting book. For me the main character of interest was Abraham Setrakian, brave survivor of the Holocaust, and warrior against the vampires. My second favorite character is Vasily the exterminator, a simple man but a master of his craft. Both of these men show determination, courage and a clear focus on what needs to be done. The rest of the characters were frankly quite boring. Would like to see more attention to detail on the physical descriptions of the characters, so we can get a mental picture of what these characters look like. I can picture Setrakian but no one else. Seems the only description of detail in appearance was that of the vampires themselves. Loved the background of Setrakian’s early life and would love to read more details of it, and also some background on Vasily. In the future books, I am hoping despite his age and health that Setrakian will live a very long life and perhaps become a mentor for Vasily who could perhaps fill the place of the son Setrakian never had. Pingback: Review: The Fall by Guillermo del Toro and Chuck Hogan « King of the Nerds!!! Pingback: The Strain: Episode 1 | King of the Nerds!! !